When scientists talk about overpopulation, they are usually referring to a population exceeding its biological carrying capacity which is defined as "the maximum number of animals that a specific habitat or area can support without causing deterioration or degradation of that habitat." Likewise, human overpopulation is when the number of people can not be permanently maintained without depleting resources and without degrading the environment and the people's standard of living. One might consider that if we were to consume less, we may be able to live within the carrying capacity of the planet. However, we should not reduce our consumption or degrade our lifestyle in order to claim that the human race is not overpopulated. Especially not as our number continues to increase. Some may argue about how much vacant room there still is on Earth to hold billions and billions of more people. However, one must consider the fact that people are all made up of atoms of matter, and that matter which comprises our bodies has had to come from the earth itself. The majority of the matter in our bodies is in the form of water. At the rate our population is presently growing, within 1200 years, our oceans would be entirely converted into people as more and more water is required to build the bodies of people. This is not even considering the water required for drinking, washing, irrigating crops, sea life, etc. 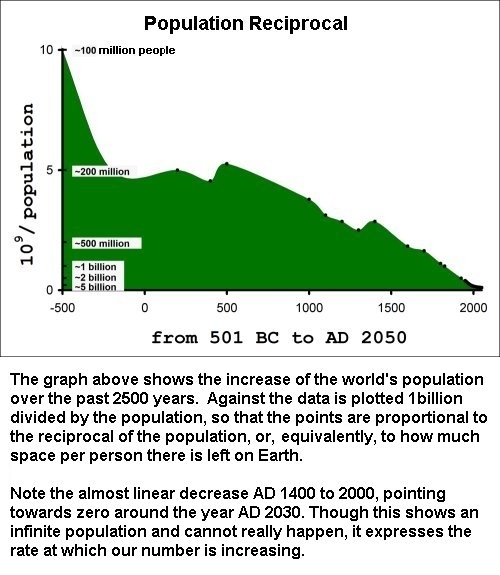 Hypothetically, if the human population continued to grow at our present rate, the mass of people would be equal to the mass of the earth within 1600 years. In 2300 years at this rate, the mass of people would fill up our entire solar system, and if you were able to create matter from nothing in order to make people, in roughly 5300 years a great sphere of humanity with a radius of over 150 light-years would be expanding faster than the speed of light. These are not predictions of things that may happen. Limitations will halt our growth much sooner. The intent is instead to illustrate how rapidly our population is growing and to express that this obviously can not continue. The growth occurs so suddenly that the population can become unmanagable without sufficient warning, after it is too late to prevent catastrophe. In short, we are in great danger of using up both space and resources.